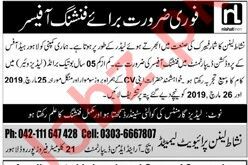 Nishat Linen Private Limited Lahore, Pakistan is looking for the services from experienced and committed candidates to fill the posts of Finishing Officer. Eligible candidates can apply us. You can apply online at vacancy after registering at http://www.jobz.pk site.